As we face more questions than answers during the recent Senate inquiry regarding the automated election systems, it is time to rethink as to whether we have to continue, abandon, or at least use the highly-recommended hybrid system. Over and above other pieces of legislation, this should be given utmost priority in light of the upcoming polls, before we use the same system which has been shown to be defective and vulnerable to massive cheating. The reason, we must remember, why we shifted to the automated election system, was because we wanted to avoid the age-old anomalies associated with the manual system, such as the dagdag-bawas and ballot switching. The new system, however, did nothing to restore our faith in the election system. Rather than making our polls credible and transparent, it lamentably led to new issues. 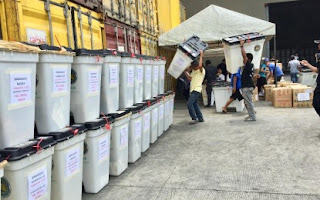 The most glaring of these is the mysterious transmission of election results a day before the actual polls—a situation for which neither Comelec nor Smartmatic has failed to give any satisfactory explanation. The early transmission, among the other anomalies pointed out by fair elections advocate Atty. Glenn Chong, strongly and unequivocally shows that there was manipulation. We cannot take this sitting down. At question here is the very core of democracy, to which the unscrupulous individuals who worked to rig the polls, showed blatant and vulgar disrespect. Merely keeping quiet about the entire fiasco and ignoring that there was obvious manipulation would be tantamount to complacency and condonation of how the automated system is making fools of us all. As many have correctly pointed out, what is the use of even participating in the electoral process if the results would not be reflective of the people’s will? On the other hand, what is the function of campaigning and political platforms if the victories of the candidates would forever be tainted with doubt? The automated election system already had two unsuccessful runs in the Philippines. While they did speed up the process of counting and transmission, they failed to address the very evil they sought out to annihilate in the first place—that of flagrantly misrepresenting the will of the electorate, and consequentially compromising democracy.